Is an eruption of one or more of the major volcanoes in the northwest United States imminent? 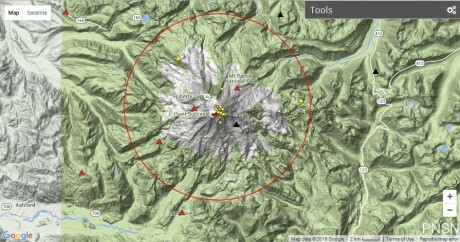 In recent days, very large earthquake swarms have been reported at Mt. Hood, Mt. Rainier and Mt. St. Helens. It is certainly not unusual for each of these volcanoes to experience earthquake swarms from time to time, but right now we are seeing this happen at all three volcanoes simultaneously, and this comes at a time when seismic activity along the Ring of Fire is on the rise all over the planet. If you have followed my work for a while, then you probably already know that I have been consistently warning that an eruption of Mt. Rainier is coming, and of course Mt. Hood and Mt. St. Helens are exceedingly dangerous volcanoes as well. If any one of the three were to erupt on a massive scale, it would instantly become the biggest news story of the year. Many of my older readers remember the devastating eruption of Mt. St. Helens back in 1980 very well. This volcano is probably not as dangerous as Mt. Hood, and it is definitely not as dangerous as Mt. 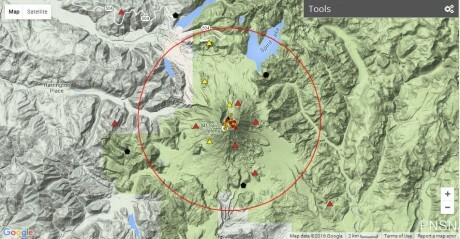 Rainier, but a full-blown eruption could still do an immense amount of damage to nearby communities. Multiple small earthquakes beneath the surface of Mount St. Helens the past two months suggest it may be recharging magma. These tiny quakes which started March 14 have been happening at a depth of two and seven kilometers — or 1.2 to four miles beneath the surface. Over the last eight weeks, there have been over 130 earthquakes formally located by the Pacific Northwest Seismic Network and many more too small to be located, says USGS. The small earthquakes beneath the surface may suggest Mount St. Helens is recharging magma. The magma chamber is likely imparting its own stresses on the crust around and above it as the system slowly recharges. The pressure drives fluids through cracks, producing the small quakes, per USGS. Mount Hood is located only about 50 miles away from Portland, Oregon, and it is one of the most dangerous volcanoes in America. Over the past 30 days, there have been 96 earthquakes at Mt. Hood, and most of them have been centered on the south side of the mountain. Why this is so alarming is because it was also the south side of Mt. St. Helens that violently exploded back in 1980. 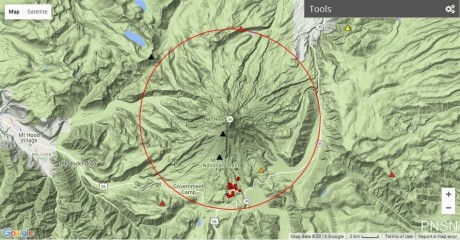 Right now, the earthquake swarm at Mt. Hood is centeredjust to the south of the main edifice (see below) and most of the earthquakes are between 3 and 5 kilometers below the surface. This is likely the zone where magma is being staged as it ascends from its source. Mt. 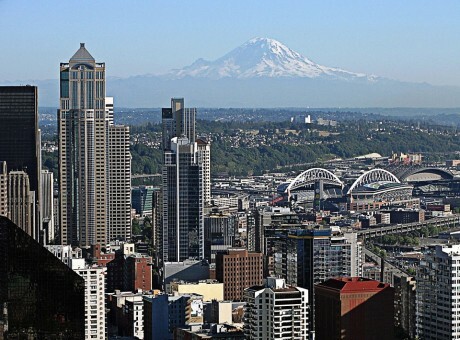 Rainier has been dubbed a “time bomb," “the most dangerous mountain in the United States” and “one of the most dangerous volcanoes in the world” because it sits so close to Seattle, Tacoma and other major cities along the coast of Washington state. In the event of a full-blown eruption, countless numbers of people would literally be buried alive in a tsunami of super-heated mud. These tsunamis of super-heated mud are known as “lahars," and scientists believe that Mt. Rainier is capable of producing lahars that could move at speeds of up to 50 miles per hour. I am so convinced that an eruption of Mt. Rainier is in our future that I even put one in my novel. If Mt. Rainier were to erupt as powerfully as Mount St. Helensdid in its May 18, 1980, eruption, the effect would be cumulatively greater, because of the far more massive amounts of glacial ice locked on the volcano compared to Mount St. Helens and the vastly more heavily populated areas surrounding Rainier. Lahars from Rainier pose the most risk to life and property, as many communities lie atop older lahar deposits. According to the United States Geological Survey (USGS), about 150,000 people live on top of old lahar deposits of Rainier. Not only is there much ice atop the volcano, the volcano is also slowly being weakened by hydrothermal activity. According to Geoff Clayton, a geologist with a Washington State Geology firm, RH2 Engineering, a repeat of the Osceola mudflow would destroy Enumclaw, Orting, Kent, Auburn, Puyallup, Sumner and all of Renton. Such a mudflow might also reach down the Duwamishestuary and destroy parts of downtown Seattle, and cause tsunamis in Puget Sound and Lake Washington.Rainier is also capable of producing pyroclastic flows and expelling lava. Scientists assure us that someday Mt. Rainier will experience another massive eruption, and it will be an apocalyptic event unlike anything the northwest United States has ever experienced before. Let us just hope and pray that we have a lot more time until that happens, because nobody should ever want to witness death and destruction on that scale. Unfortunately, the crust of our planet is becoming increasingly unstable, and the west coast of our country sits directly along the Ring of Fire. It is only a matter of time until a major seismic event strikes, and it may be a lot sooner than a lot of people think.